Taken from the gradebook of a teacher who is pleased to see consistent improvement from his students, here is the Pittsburgh Steelers Report Card for the win over Baltimore Ravens at M&T Bank Stadium. Mike Hilton led secondary with three critical plays in the Red Zone, two of which came against runs and another was a pass defensed in the end zone that a “little guy” like him isn’t supposed to make. Sean Davis led the team with 9 tackles is blossoming as a free safety. Morgan Burnett saw his most extensive action, and while he got beaten on a few plays, he stabilized as the game continue. Coty Sensabaugh had another quiet afternoon which is good for a corner. When the Baltimore beat Pittsburgh just 35 days ago at Heinz Field, the Steelers looked like a team doomed to be mired in mediocrity for the entire season. In the four games since then, the Steelers have established themselves as the sole leader of the AFC North. Keith Butler has brought the defense along since that ugly night. The Steelers defense still has issues and remains a long way from the shutdown form it was flashing just one year ago, but Butler’s boys have managed to reduce the long plays while playing the pass more consistently, even when they can’t constantly harass the quarterback. Randy Fichtner’s offense has also improved. 5 weeks ago the Steelers offense only seemed capable of producing in the 2nd and 3rd quarters and couldn’t convert third downs. Since then Steelers offense has consistently done both, while improving in the Red Zone. 12:39 remained in the fourth quarter. A holding penalty on Alejandro Villanueva had just sent the Steelers back to their own 5 yard line, bringing up 2nd and 20. And trainers had just helped Ben Roethlisberger from the field. If ever there was a moment for the Ravens to tip the momentum in their favor it was this. Those were the conditions that under which Joshua Dobbs made his NFL debut. And the rocket scientist not only didn’t flinch, he executed a picture perfect pass that secured a first down and set up the next long play that set up the next score. For his poise under pressure, Joshua Dobbs wins the Unsung Hero Award for the Steelers 2018 win over the Ravens at M&T Bank Stadium. Their defense couldn’t stop the big play, couldn’t pressure the passer, while the offense remained incapable of consistency. A different Pittsburgh Steelers team took the field against the Ravens at M&T Stadium to earn a 23-16 victory and sole possession of the AFC North lead. While notching an AFC North road win was important, the key take away from the win over the Ravens is how the Steelers secured victory. In his press conference, Mike Tomlin pointed to Red Zone performance and the ability to convert third downs as the drivers of the Steelers victory. And Tomlin is right. But the qualities underlying the Steelers success in the Red Zone and on 3rd down are far more important: Focus, balance and poise. The key stats in the game are the Steelers and Ravens respective performances in the Red Zone. The Steelers made four trips to the Red Zone and scored 3 touchdowns and 1 field goal. The Ravens made three trips to the Red Zone and scored 2 field goals and 1 touchdown. The Steelers first two touchdown passes represented workman like efforts, that culminated in short touchdown passes from Ben Roethlisberger to James Conner and Antonio Brown. The Ravens drives were also reasonably workman like, but they featured some nice runs by Alex Collins. While it would be incorrect to conclude that Baltimore was imposing its will on the Steelers rushing defense, both field goal drives proved that the Ravens could run on Pittsburgh. But thanks, in no small part, to efforts of Mike Hilton against the pass and then against the run, Baltimore was forced to settle for 3 points both times. The mathematical difference of is easy to understand, but Pittsburgh’s Red Zone superiority also altered the dynamic of the game as the Steelers would show at beginning of the 2nd half. Thanks to some stout work by the defense, the Steelers got the ball back with 49 seconds left to go in the 2nd quarter. Instead of mounting one of their patented 1 minute drives, Vance McDonald proceeded to test the collective cardiac health of Steelers Nation with two almost fumbles. 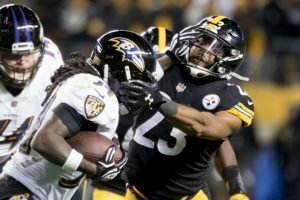 Instead of going into the locker room with extra points, the Steelers clumsy close to the first half opened the door to doubts about their ability stay in control. The Steelers offense answered those doubts by opening the 2nd half with a 15 play 75 yard drive that burned 8:14 seconds off of the clock, and put Pittsburgh up 20 to 6. Now, down 14 points, Baltimore was forced to abandon its running game and become one dimensional. For a time, however, it looked like one-dimensional might be enough, as the Joe Flacco led the Ravens an 11 play 75 yard drive that narrowed the difference to 7 in just 3:50 seconds. The Steelers offense followed with a 3 and out and momentum appeared to be shifting to Baltimore as the third quarter ended. Keith Butler’s defense responded by forcing a 3 and out of their own as Vince Williams and Bud Dupree teamed to sack Joe Flacco at his own twelve. 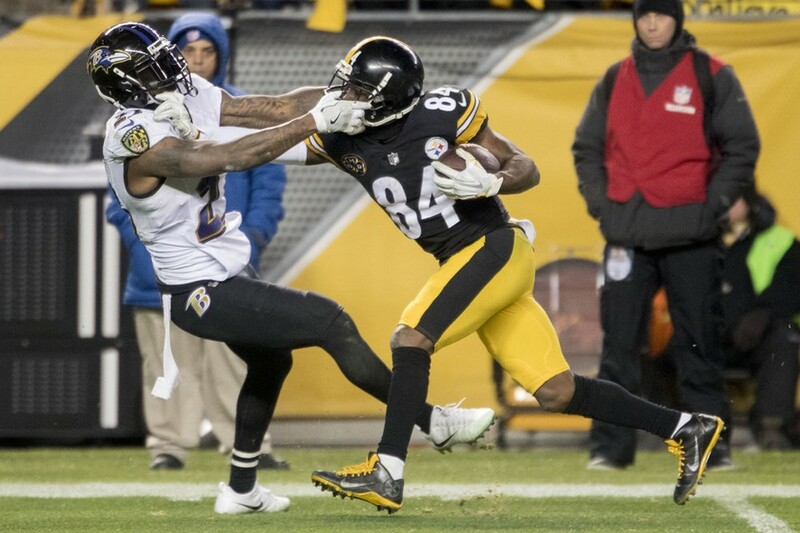 Yet, the Steelers found themselves in almost exactly the spot on the field, as a penalty on a Ryan Switzer punt return put the Steelers on Baltimore’s 15. A pair of penalties and an injury to Ben Roethlisberger left the Steelers at 2nd and 20 on Baltimore’s fifteen, leaving Joshua Dobbs standing under center taking his NFL snap. The conventional wisdom of the situation screamed: Hand the ball to James Conner! And that is apparently what Randy Fichtner intended to do. 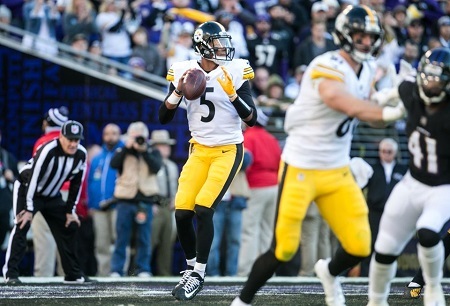 But the young Rocket Scientist turned NFL quarterback saw something he liked in the Ravens alignment, and with the poise worthy of a 10 year veteran, Dobbs checked out of the running play, dropped five yards deep into his own end zone, planted his feet and rifled off a 22 yard dart to JuJu Smith-Schuster. Two plays later Ben Roethlisberger hit Jesse James, who saw the ball bounced and bobble off his body, but James maintained focus, brought the ball home and moved the Steelers 51 yards down the field. This time the Steelers stalled in the Red Zone, but a Chris Boswell field goal was enough to extend the lead to 7 points. The Ravens got all the way to the Steelers 19, aided by a Coty Sensabaugh pass interference play, but head up plays by Cam Heyward, Sean Davis and Anthony Chickillo forced Baltimore to settled for 3 again. The Steelers next drive only saw them go 19 yards, but in converting 2 third downs, Pittsburgh milked over four and a half minutes off of the clock. Baltimore got the ball back with 44 seconds left to play, but a Stephon Tuitt sack of Joe Flacco rendered the rest of the Ravens plays into an academic question. 35 days ago the Steelers 2018 season seemed to be dead in the water. Pittsburgh was 1-2-1, tied for last in the AFC North without a conference victory to their names. Since then the Steelers have authored victories against the Atlanta Falcons, Cincinnati Bengals, Cleveland Browns and now the Baltimore Ravens. While the victory over the Falcons can rightly be labeled as a blow out, the outcome of each of the other 3 games remained in doubt until end of the 3rd quarter, if not later. In each of those games, a breakdown on the part of the Steelers allowed their opponents to threaten a comeback with a late score. But in each instance, Pittsburgh responded with poise instead of panic which has paved their for the Steelers offense and defense to respond with scores and stops of their own. While you’d like to see your team put opponents away, Pittsburgh’s poise under pressure is a quality that will serve the Steelers well down the stretch. From the grade book of a teacher who wonders if his students are underachieving or simply underwhelming to begin with, here is the Pittsburgh Steelers Report Card for the 2018 home loss to the Ravens. For all of the accolades that Ben Roethlisberger has won, and for whatever statistics milestones the offense had achieved before the game, the Steelers offense had been inconsistent all season long as it struggled on third downs disappeared for quarters at a time, only scoring 13 points in the 1st and 4th quarters. Why does the Steelers offense explode in the 2nd quarter only to tapper off in the 3rd and then completely peter out in the 4th? Do Randy Fichtner’s scripted plays fall flat, leading him to adjust only to have defenses readjust? That’s almost certainly a simplistic explanation, but it makes as much sense as any other offered. Clearly Ben Roethlisberger must be more consistent, but is just is clear that Randy Fichtner must create the conditions for Roethlisberger to be consistent. Thus far Fichtner has failed. On defense, it is hard to know what to say. Is it Keith Butler‘s fault? Or is Mike Tomlin micro managing him? Has Kevin Colbert, with or without Mike Tomlin’s assent, emphasized drafting for athletic talent at the expense of polished football skill? Or are the Steelers assistants deficient in developing that talent? Sure the Steelers forced field goals and secured a turnover in the Red Zone, but that hardly matters when an offense can protect a 4 point lead by authoring back-to-back 6 minute plus 2nd half. If the Steelers coverage is so weak that it can only rush 3 men, then perhaps the disease is worse than the cure, because at least big plays get the offense back on the field quickly. And the fact that we’re even having this discussion underlines just how deeply into dysfunction the Steelers defense has sunk. This young player caught a couple of passes, including a key 3rd down conversion, ran a play out of the backfield, and feathered the Ravens with a long enough kick return that they squibbed the next kickoff it to Roosevelt Nix and for that Ryan Switzer wins the Unsung Hero Award for 2018 loss to Baltimore at Heinz Field. Heath Miller once suffered a hit so ferocious it kept him out for 2 weeks afterwards – and this was before the NFL instituted its concussion protocols. Both teams were staking legitimate claims to being biggest boy on the AFC North block and neither was backing down. And that’s what made this one feel different. The Ravens didn’t necessarily assert their AFC North superiority — Cincinnati’s still leads the division — but Baltimore laid bare the 2018 Pittsburgh Steelers mediocrity for all the world to see. The game ends alternatively as a player like T.J. Watt or James Conner makes a dramatic dramatics that keep the Steelers from losing, OR the Steelers defensive front seven, which features 3 number 1 picks, 1 number 2 pick and a number 3 pick, gets abused by a running back on a play when EVERYONE knows is coming. Sound sarcastic? Sadly it is not. The 2018 Pittsburgh Steelers follow a pattern, and they follow it well. And Pittsburgh would be in business if could convince Roger Goodell fashion a sort of pro football equivalent of a Fabulous Freebirds Rule (Google it) declaring that the Steelers only need keep score for the 2nd and 3rd quarters. Were that the case the Steelers wouldn’t simply be 4-0, they have outscored their opponents 87 to 30. Alas, the game of football is still played for 60 minutes, and the Pittsburgh Steelers have been outscored 76 to 15 in the first and fourth quarters. Yet, if the Steelers have followed a script thus far in 2018, Ben Roethlisberger has not. As the Steelers strong performances in the 2nd quarter suggest, Ben Roethlisberger hasn’t “lost it.” He’s still capable of making every throw he needs to make, he can still work the two minute drill, he isn’t playing with a compulsion to force the ball, and he can still make good decisions. But by his own admission, Ben Roethlisberger isn’t on the same page as anyone. True, he is more out of sync with Antonio Brown than anyone else, but last night saw a second half in which Roethlisberger misfired to JuJu Smith-Schuster, James Washington, Jesse James and Ryan Switzer on numerous occasions. Is this because Ben Roethlisberger didn’t play enough in preseason or during training camp? 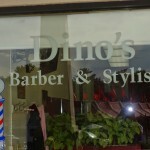 Is it because he takes of Wednesdays and needs more preparation? Mike Tomlin had better figure out the answer, because the Steelers need Ben Roethlisberger to carry them. Four games into 2018 the Steelers now know that they have a good NFL running back in James Conner. Steelers fans can now also see the difference between a good NFL running back, and a great, Hall of Fame Caliber talent in Le’Veon Bell (who, by the way reminds us he still wants to retire a Steeler – thanks Le’Veon). 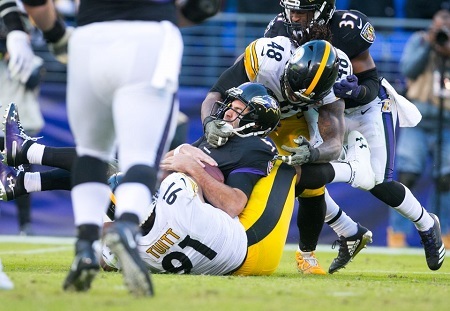 On paper it would seem like the Steelers defense approached decency against the Ravens. However, the Steelers defense couldn’t deliver when it counted, as the Ravens converted 8 of 17 third downs. Worse yet, as Baltimore was nursing a 6 point lead, the Steelers defense gave up two six minute plus drives. The situation screamed for a Cam Heyward, or Joe Haden or Stephon Tuitt to make a play. Yet neither they, nor anyone else did. Worse yet, no one watching the game would have felt the Steelers defense was capable of making a game-changing play. 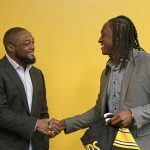 Can the Steelers Salvage Something of 2018? The quarter pole of the 2018 season finds the Pittsburgh Steelers at 1-2-1 and mired deep in mediocrity. If Ben Roethlisberger find a way to play well for more than just the 2nd and 3rd quarter, the Steelers could compete with a lot of teams. Maybe. If Mike Tomlin and Keith Butler could could find a way to both pressure the passer AND not leave gaping holes in their secondary, the defense could play well enough not to require transforming each game into a shoot out. Maybe. If the special teams could set up and make a play ever now and then, it would take some heat off of offense and defense. Maybe. That’s a lot of maybes. And teams that depend on “maybes” heading into October are by definition mediocre ones. That’s who the Pittsburgh Steelers are right now. The Steelers thrilling AFC North Clinching win over the Baltimore Ravens capture the imagination of Steelers Nation if our Steelers-Ravens game ball poll participation is any indication. In total, the poll drew of 195 votes, by far the largest of the year and perhaps in the history of the poll. And the voting for the top spot was fierce, as Ben Roethlisberger edged out Antonio Brown by a vote of 39 to 34. That’s not surprising, since the Steelers dynamic duo was unstoppable all night. Down the ballot, Chris Boswell claimed third place which should come as no surprise as he kicked four field goals, including a 52 yarder and of course the 46 yard game winning field goal. Le’Veon Bell cam in 4th with 21 votes, on the heels of a very strong, 100 yard from scrimmage performance against a tough Ravens defense. T.J. Watt, whose strip sack of Joe Flacco sealed the game, was close behind earning 50 votes which was enough for 5th place. 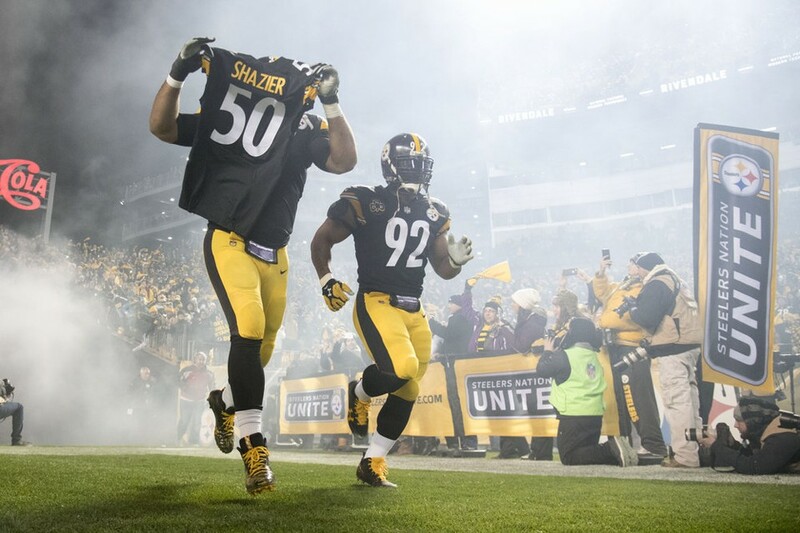 #Shalieve50 came in with 19 votes19, as support for Ryan Shazier and his inspiration to the team was very evident both on the field and in the stands at Heinz Field. Jesse James, who just missed a 100 yard receiving game and came up with several clutch catches throughout the night came next, with 19 votes. After that, the voting dropped off markedly. 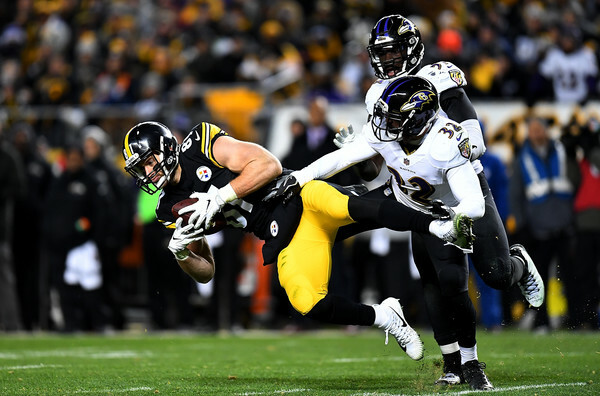 Vance McDonald came in with four votes, despite a plea by staff writer Tony Defeo in favor of the Steelers tight ends, and a nod from the Steelers Ravens Report Card, which named both tight ends as unsung heroes. Cam Heyward got two votes while Vince Williams got 1. There were also write in votes for a “Total Team Effort” which polled the support of 7 write-in voters, as well as three for the Steelers offensive line, who got 3 write-ins. As always, Steel Curtain Rising offers its sincere thanks to everyone who took the time out to vote, and gives a special nod of thanks to any and all who took the time to write in their choices. Now Go Steelers! Let’s beat the New England Patriots! For the record, I’m not the regular Report Card marker for Steel Curtain Rising, so its really not my place to suggest that Jesse James and Vance McDonald get “A” for their efforts in the Steelers win over the Ravens. But, the position, particularly Jesse James and Vance McDonald, certainly deserved to win the Steelers Report Card’s Unsung Hero Award as they did during the Steelers AFC North Clinching win over the Ravens for playing a much-bigger part of the game-plan than anyone could have possibly envisioned. With JuJu Smith-Schuster sidelined while serving a very-controversial one-game suspension for his block on Bengals linebacker Vontaze Burfict last week, and with Martavis Bryant continuing to baffle with his inability to get open–this despite Antonio Brown drawing constant double-teams–one wondered who would pick up the slack in the Steelers air-attack. 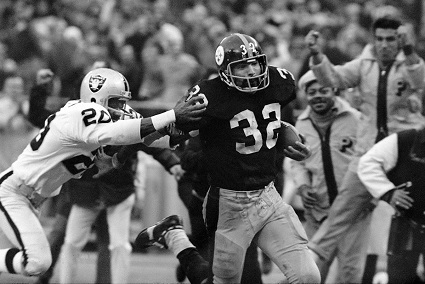 The answer became clear, early on, as James and McDonald combined for four receptions for 45 yards on Pittsburgh’s first two offensive series. Perhaps not so coincidentally, the Steelers first two drives ended in touchdowns and a 14-0 lead. Speaking of Vance McDonald, he’s sort of been this year’s version of Ladarius Green, who was an athletically gifted tight end the Steelers signed as a free agent prior to the 2016 campaign, but, thanks to concussion-related problems, only played in a handful of games in his lone season in Pittsburgh. Vance McDonald may not have come to Pittsburgh with the same physical gifts as Green, but when the Steelers acquired him in a trade with the 49ers this past summer, he certainly possessed the size, speed and athleticism Pittsburgh had been searching for at the tight end position for many years. Unfortunately, McDonald has been battling the injury-bug for most of 2017, and he was even forced to leave Sunday night’s game with a shoulder ailment. But, before Vance McDonald exited the game, he tallied four receptions for 52 yards. This might not seem like much, but considering Eli Rogers and Bryant combined for a mere 66 receiving yards, Vance McDonald’s contribution as welcome as it was necessary. Speaking of contributions, what about the night Jesse James had for the Steelers on Sunday? In perhaps the finest game of his young Steelers career, the Pittsburgh native and Penn State product Jesse James pulled in 10 passes for 97 yards. James may have even come up with the night’s most-crucial reception. Trailing by two points with just 1:57 remaining in the game, the Steelers faced a third and 13 from their own 14-yard line. If Pittsburgh didn’t pick up at least a good chunk of yardage on the play, the game would most-likely be over. 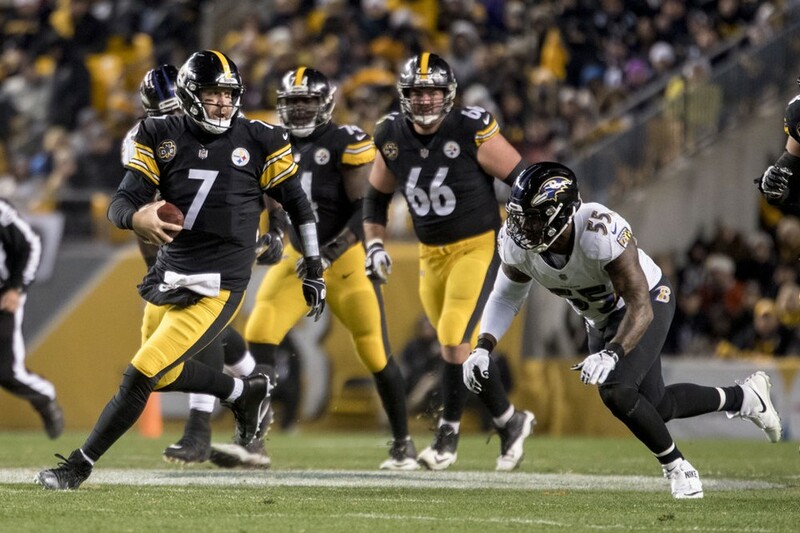 However, quarterback Ben Roethlisberger found James 16 yards downfield, and the tight end managed to hold on to the pass in traffic, which laid the groundwork for what would become the game-winning field goal drive. All-in-all, James and McDonald combined for 14 catches for 149 yards on the night. Enough to make the fans stop chanting “HEATH!!!! !” (in honor of legendary tight end Heath Miller) each time a caucasian tight end catches a pass at Heinz Field? But, in a nip-and-tuck, prime-time affair with the AFC North title on-the-line, the Pittsburgh Steelers certainly needed everything Jesse James and Vance McDonald could give them, Sunday night. And their contributions should not go unnoticed. The Pittsburgh Steelers 39-38 win over the Baltimore Ravens clinched the franchise’s second consecutive AFC North Championship. Winning in such dramatic fashion without Ryan Shazier, must be regarded as a positive because Ryan Shazier was a leader of the Steelers defense. Yet the Steelers path to victory also revealed the double-edge sword that accompanies rallying around a fallen comrade. The true test of leadership is the ability of the rest of the team to excel in a leader’s absence. 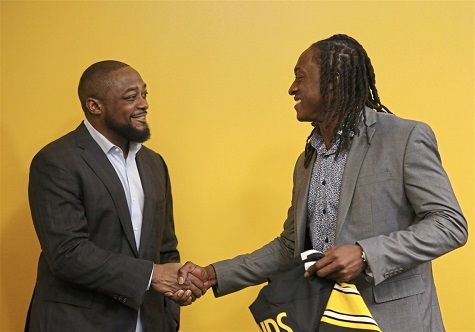 But it’s also often observed that efforts of those left behind are doomed “poor for the leader’s absence.” Both of those things were evident in Steelers win over the Ravens at Heinz Field, and together they form a new “Elephant” in Mike Tomlin’s room. Ryan Shazier might have been in the hospital at UPMC but his teammates certainly made sure everyone at Heinz Field felt his presence on Sunday against the Ravens. Cameron Heyward and James Harrison carried his jersey out of the tunnel during introductions. Several players wore Number 50 shirts under their pads. #Shalieve50 signs littered the stadium. So it was only fitting that 8 plays into the game, Sean Davis would intercept a pass at the goal line and return it 35 yards. It only took 7 plays and a couple of Ben Roethlisberger hook ups with Martavis Bryant, Jesse James and Le’Veon Bell to move into the Red Zone, and from there Ben Roethlisberger connected with Le’Veon Bell who was in the end zone with the help of 3 missed tackles by the Ravens. The Steelers defense forced a punt, and then it was Ben Roethlisberger to Vance McDonald and Antonio Brown on the ground with help from Le’Veon Bell and James Conner on the ground. By the beginning of the second quarter, the Steelers were knocking on heaven’s door again. Bell ran it in from the 1, and the Steelers were up 14 to 0. The entire Steelers roster was feeling the full force of #Shalieve50 and it was a beautiful moment to be a part of Steelers Nation…. The phenomenon of a team rallying around an injured teammate is very real. Last year Cam Heyward’s injury seemed to doom the Steelers 2016 season. But the defense staged a 180, and Johnny Mitchell’s defensive line was very much a part of the change. But the rallying effect has its limits, as emotion can rarely completely compensate for a loss of talent. And so it was for the Steelers defense in the second quarter. Credit John Harbaugh, Joe Flacco and the rest of the Ravens. To borrow a Tomlinism, they refused to blink. Rather than panic and try to play quick catch up, the Ravens attacked the Steelers defense where it was most vulnerable, running Alex Collins up the middle gouged the Steelers for a couple of decent runs before Chris Moore got ahead of Coty Sensbaugh and behind Sean Davis for 30 yard touchdown pass. The Steelers only managed a 52 yard Chris Boswell field goal in response before the Ravens were back at it again. First it was Alex Collins taking a short screen for 37 yards as Arthur Moats, Sean Davis and Vince Williams inexplicable failed to either tackle him or push him out of bounds. After that, came an expertly executed pass fake that saw NBC’s camera, as well as the entire Steelers defense lose track of Alex Collins. By the time the Steelers figured out Collins had the ball, he was already closing in on the pylon. The Steelers answered with another field goal to end the first half, which has been their MO this season. The Ravens had clearly regained their footing. Pittsburgh, in contrast, was wobbling. If the Ryan Shazierless Steelers defense had begun to wobble in the 2nd quarter, the ground slipped completely out from under Pittsburgh’s in the 3rd period. The Baltimore Ravens began the 2nd playing from behind and within 14 minutes they transformed a 6 point deficit into a 11 point advantage! In between Pittsburgh’s defense self-destructed in perhaps every way possible, from inane personal fouls, to a costly if questionable Artie Burns pass interference play in the end zone. Time will tell if Sean Spence was available in early December for a good reason, but against the Ravens he clearly looked like someone who’d been out of football since October. He failed to get off his blocks, missed tackles and was a half-step behind the Ravens running backs who were tearing through the second level. The Steelers offense didn’t do the team any favors in the 3rd quarter either. While it is hard to pin point the reason why, but for 15 minutes the Steelers offense reverted to the ineffectiveness that plagued Pittsburgh for much of the first half of the season. While Steelers did manage to begin the 4th quarter with a Chris Boswell field goal, when they got the ball back with 10:29 left to go, they still faced an 8 point or two score deficit. 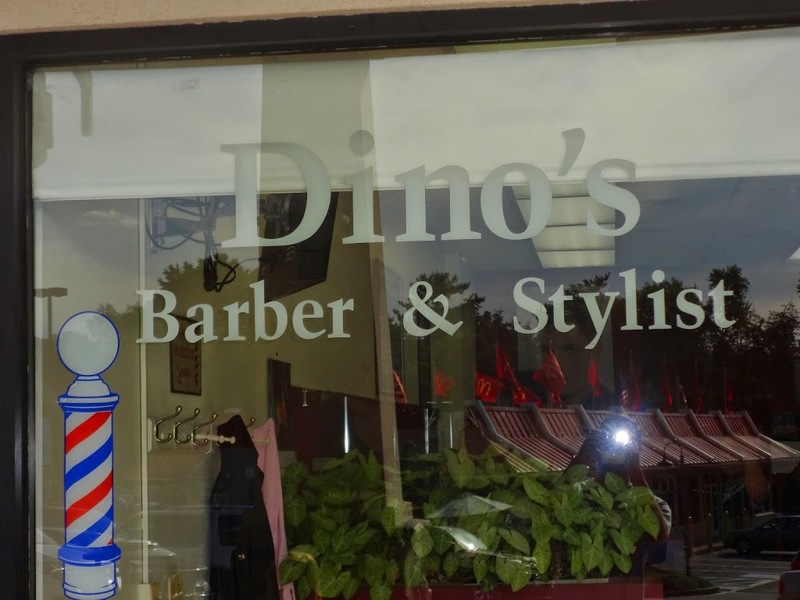 Which is hardly enough to make Ben Roethlisberger and Antonio Brown break a sweat. It took the duo less than 75 seconds to get the Steelers to the one, where Ben Roethlisberger connected with Roosevelt Nix to pull Pittsburgh within two. And then, almost as if on cue, Sean Davis and Artie Burns committed penalties, paving the Ravens return to the end zone. So with six minutes left, the Steelers had another 9 point deficit to beat. And again, Ben Roethlsiberger, Antonio Brown, Le’Veon Bell and Eli Rogers were up to the task, driving 68 yards in just over 3 minutes to narrowing the score to a difference of two with 3:29 left to play. For once, the Steelers defense found its footing as Joe Flacco failed to convert a 3rd and 3 thanks to some smart work by Arthur Moats and Sean Davis. Put Pittsburgh in a position to win in a race against the clock. Leaving Joe Flacco and the Ravens 42 seconds on the clock is a dangerous thing to do, but Flacco misfired on two deep passes before connecting with Mike Wallace for 15. With one more shot, Flacco faded back, not noticing that T.J. Watt had switched sides strong side to make a strip sack that ended which game. To steal an idea for Steel City Insider’s Jim Wexell, the past two weeks have exposed a new Elephant in Mike Tomlin’s room: Andy Dalton and Joe Flacco have carved up the Joe Hadenless and Ryan Shazierless Steelers defenses with relative ease, and neither is the caliber of quarterback that Tom Brady is. Mike Tomlin and Keith Butler need to find some way to slow Brady down to give the Steelers offense a chance to keep pace. That’s a pretty big elephant to manage inside a “room” that gives Pittsburgh zero margin for error. Unless Joe Haden defies expectations and can play, Tomlin and Butler need to corral the proverbial elephant with the pro football equivalent of spit, duct tape and bubble gum. But if Tomlin and Butler can pull it off, then the spirit of #Shalieve50 combined with the resiliency of the 2017 Steelers just might carry the day. Another week another Chris Boswell field goal at the buzzer, or almost buzzer as the case may be as the Pittsburgh’s defense held on for 42 precious seconds as the Steelers beat the Ravens 39-38 to clinch the AFC North title. As we do after every Steelers win, we invite you the citizens of Steelers Nation to vote on Steelers game ball winners. Scroll down below the photo for a look at this week’s ballot. Leading things off are Antonio Brown and Ben Roethlisberger, and really that’s an alphabetical order decision, as both men had phenomenal games, with Antonio Brown hauling in 11 catches for an eye popping 213 yards while Ben Roethlisberger became the first quarterback in NFL history to throw for over 500 yards in a game. Behind them is Le’Veon Bell, who had yet another 100 yards from scrimmage night as he scored two touchdowns on the ground and 1 on through the air. Jesse James also gets to nod who caught 10 passes and fell just short of cracking the century mark. Vance McDonald only had 4 catches before leaving the game early, but he was a critical enough of a target for Ben Roethlisberger that the low number can help but suprise. And of course Chris Boswell also gets a slot, who was a perfect 4 for 4 on field goals, including the 46 yard game winner, and 3 for 3 on extra points. On defense, the ballot gets much more complicated. For example, take Sean Davis for example. The Sophomore safety started the game off with an interception, and had a hand in breaking up a 3rd down pass on the Ravens penultimate possession, but in between missed tackles, got beaten for a long touchdown, and made a series of inanely idiotic penalties that paved the way for more Baltimore scoring. Vince Williams was the second leading tackler for the Steelers, and he had a sound night there manning the middle. 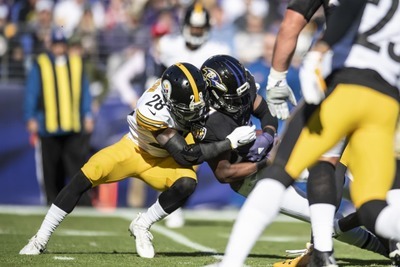 T.J. Watt also gets a ballot slot, as the rookie outside linebacker stepped up to pressure Joe Flacco into key third down incompletion and essentially ended the game with a strip sack. Cameron Heyward also gets a slot on the ballot. Heyward’s stat sheet lists all of 1 tackle which might not look that impressive, but after the Ravens went up by eleven, Cam Heyward gathered the defense on the sidelines and started giving everyone a piece of mind. The play of the Steelers defense improved after that. Finally, we’re listing a slot for #Shalieve50. 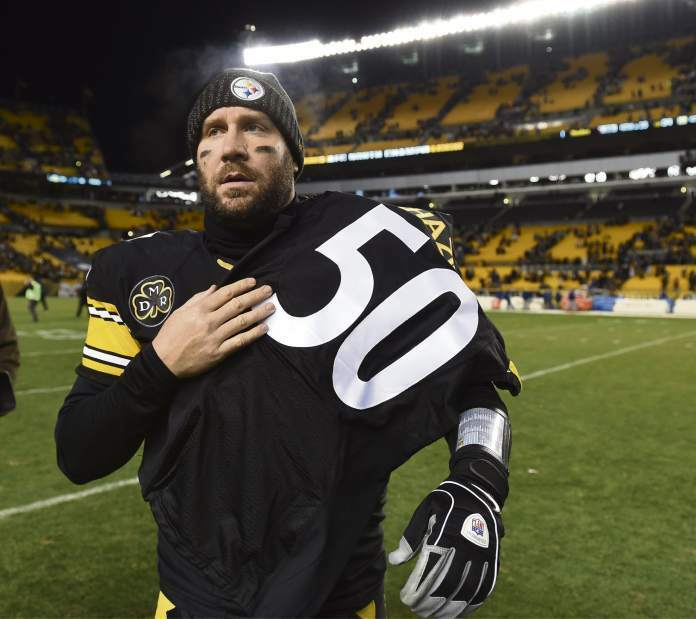 The Steelers defense clearly missed Ryan Shazier’s athleticism on the field, but it’s obvious that number 50 served as an inspiration to all. As always, keep in mind that this is your poll, not mine. If you think that say, Martavis Bryant deserves a game ball, write his name in. Ditto Eli Rogers or Roosevelt Nix, write their names in and cast your vote. The Steelers game against the Ravens ended at close to 2:00 am here in Buenos Aires, and the work day is already upon us. Please click here for our full analysis of the Steelers AFC North Clinching win over the Ravens.